Cesare Maccari (1840–1919), Cicero Denounces Catiline (1889), fresco, 400 x 900 cm, Palazzo Madama, Rome, Italy. Wikimedia Commons. Plutarch’s biography of Cicero, the Roman orator and statesman, is the last of his Lives which has been extensively depicted in paint. After some fairly inconsequential discussion over his ancestry and birth, we are told that Cicero was a precocious scholar who established himself as the finest orator and poet of his day. Cicero continued to learn from Philon the Academic, kept company with Mucius Scaevola when he was leader of the senate, and did military service under Sulla in the war against the Marsians. The Roman state then underwent a traumatic period, during which the young Cicero kept his head down, but once matters became more settled under the leadership of Sulla, Cicero prepared for public life. He defended the son and heir of a man who had been put to death, and who had been indicted by Sulla for the murder of his father under trumped-up evidence. Although Cicero won his case, he remained in fear of Sulla, and perhaps wisely took the opportunity to visit Greece, ostensibly to aid his health. When Sulla was dead, Cicero’s friends at home urged him to return, but he travelled on to visit some noted orators in Asia Minor and on the island of Rhodes. Before going back to Rome, he consulted the oracle at Delphi, who advised him to make his own nature his guide in life, and not to be swayed by the opinion of the multitude. Cicero then worked as an advocate, and remained cautious. He was appointed quaestor during a period of grain shortage, and allocated the island of Sicily, where farmers were upset at being forced to send all their grain to supply Rome. He established his reputation there for defending many young men who were sent for trial on grounds of lack of discipline and courage in war. As was usual with him, he would not accept fees or gifts for his legal work, and continued to live a modest lifestyle, unlike many others. Francesco Zuccarelli (1702-1788), Cicero Discovers the Tomb of Archimedes (1747), oil on canvas, dimensions not known, Private collection. Wikimedia Commons. Although Plutarch doesn’t describe the story, when Cicero was in Sicily he claimed to have discovered the location of Archimedes’ tomb. 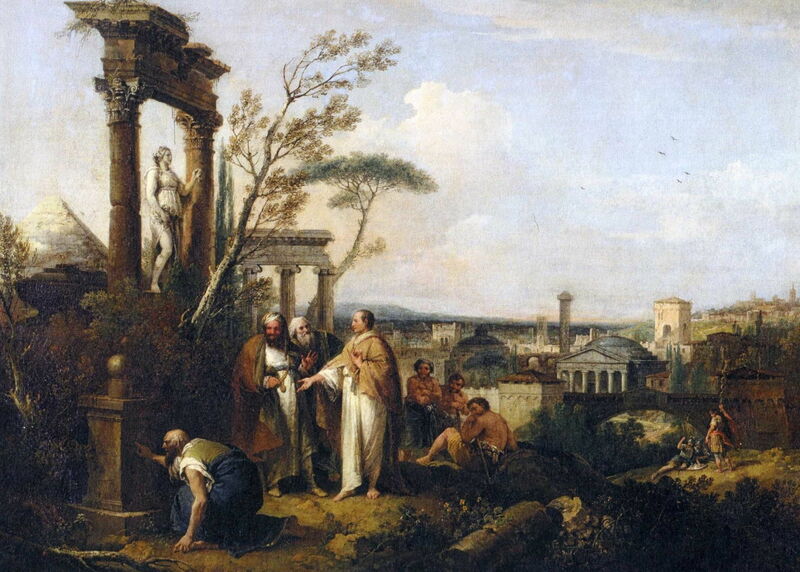 Francesco Zuccarelli’s painting of Cicero Discovers the Tomb of Archimedes from 1747 shows this event, with the city of Syracuse behind. Benjamin West (1738–1820), Cicero Discovering the Tomb of Archimedes (1804), oil on canvas, 125.7 × 182.2 cm, Yale University Art Gallery, New Haven, CT. Wikimedia Commons. In 1797, the American history painter Benjamin West painted his Cicero Discovering the Tomb of Archimedes. He painted it again in 1804 (the almost identical version shown above), which was also the year that Napoleon became Emperor of the French. Cicero wrote in his Tusculan Disputations (book 5, sections 64-66) that the tomb was neglected and buried in undergrowth, near the Agrigentine Gate of Syracuse. Cicero described the cylindrical column with a sphere mounted on top, which is shown partly obscured in West’s painting, and was a symbol of Archimedes’ mathematical achievements. West shows Cicero wearing a white toga, speaking in front of the tomb, as workers with sickles clear the undergrowth from it. In the distance is the city of Syracuse on its coastal plain, and beyond it the smoking cone of the active volcano, Mount Etna. Paul Barbotti (1821-1867), Cicero Discovering the Tomb of Archimedes (1853), oil on canvas, 148 x 208 cm, location not known. Wikimedia Commons. 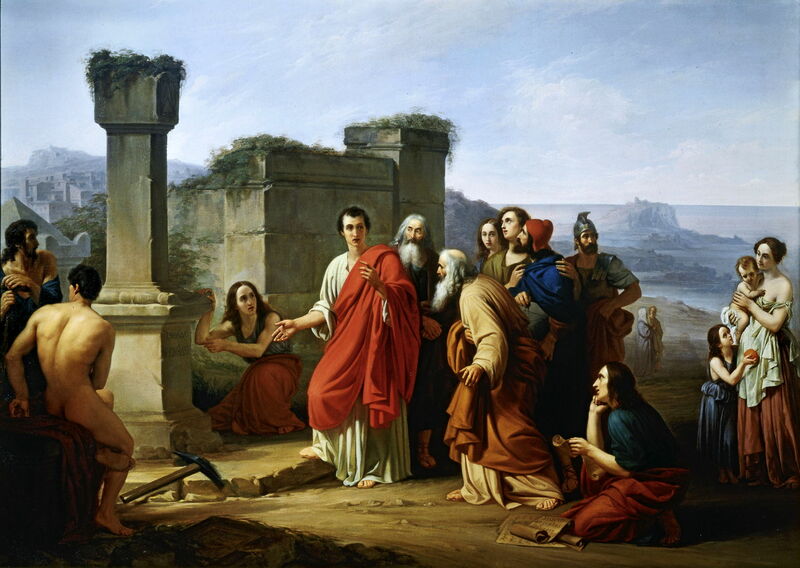 Paul Barbotti’s Cicero Discovering the Tomb of Archimedes from 1853 at least shows Cicero as a young man, although there is no sign of the cylindrical column with a sphere on its top. Plutarch tells us that Cicero had some modest properties, including a country house at Arpinum, to the south-east of Rome, and two farms, one near Naples and the other near Pompeii. His health was always a bit delicate, but was managed by careful diet and exercise. 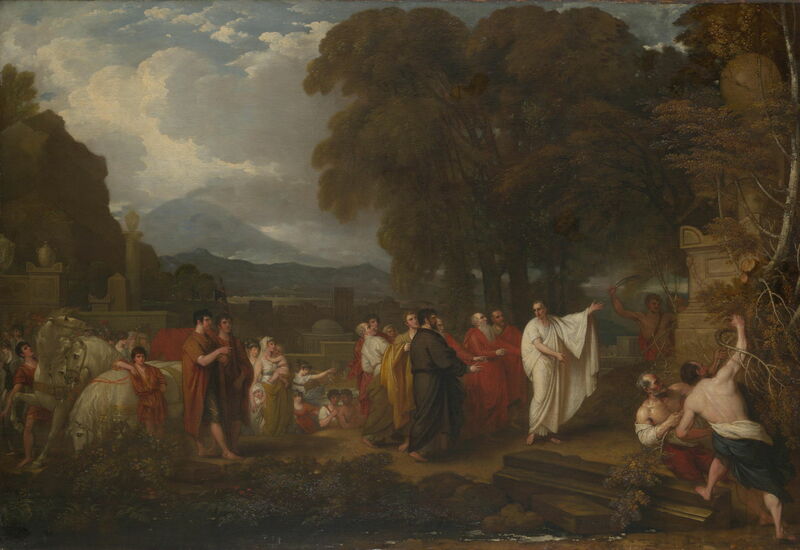 Richard Wilson (1713–1782), Cicero with his Friend Atticus and Brother Quintus, at his Villa at Arpinum (c 1771), oil on canvas, 121.8 x 174.5 cm, Art Gallery of South Australia, Adelaide, Australia. Wikimedia Commons. In about 1771, Richard Wilson painted this marvellous historic landscape of Cicero with his Friend Atticus and Brother Quintus, at his Villa at Arpinum. 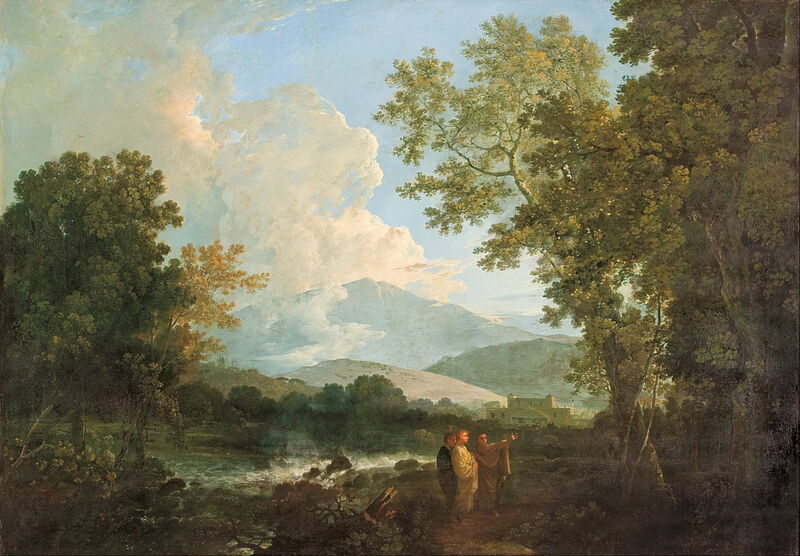 Wilson was a pioneer British landscape artist, the father of Welsh painting, and this work seems to have influenced Pierre-Henri de Valenciennes in his later painting of Cicero Discovering the Tomb of Archimedes from 1787; sadly I have been unable to locate a suitable image of that to show here. When he served as a praetor, Cicero established a reputation for integrity and fairness. He then stood for the consulship, supported by both the aristocrats and common people. Leading forces of revolution in the city was Lucius Catiline, a man with a dreadful reputation. Catiline had corrupted many of the young men by funding their debauched behaviour, stood against Cicero, and lost. Early during his period as consul, Cicero had many problems to face. There was a marked reaction against the unjust laws of Sulla, and new moves to sell public lands. Cicero acted with great acumen, and vehemently opposed the new laws in the senate. His skill as an orator won the day. Catiline, though, grew in his influence, thanks largely to the support that he got from soldiers who had served Sulla. 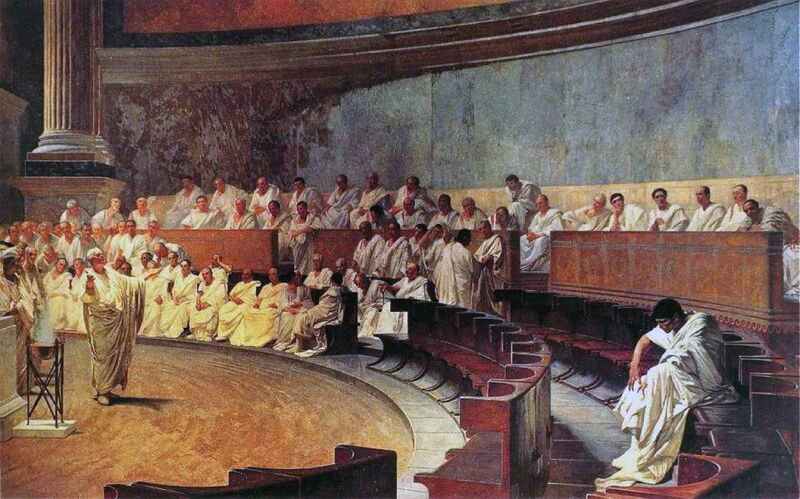 When the time came for the next consular elections, Cicero postponed them, and summoned Catiline to the senate. The latter was uncowed and brazen in his criticism of the senate, so Cicero rallied popular support, ensuring that Catiline was once again unsuccessful in his quest to be made consul. One night after Crassus had dined, he was brought letters warning that Catiline would cause much bloodshed, and advising him to flee from Rome. Crassus went at midnight to Cicero, seeking his intervention. Cicero summoned the senate to assemble at dawn, and there instructed those who had written to Crassus to read their letters out loud in front of the senate. Each told of Catiline’s plot. The senate put the matter into the hands of the consuls to address. Cicero trusted matters outside Rome to Quintus Metellus, but took charge of the city himself, with the support of a large bodyguard. Catiline ordered two of his men to go to Cicero at his house at dawn and murder him, but Fulvia informed Cicero of the plan, and the attack was blocked. Cicero then went and summoned the senate to the temple of Jupiter Stator, on the slopes of the Palatine hill. When Catiline arrived, no one would sit near him; as he tried to speak in his defence, he was constantly interrupted, following which Cicero rose and told Catiline to leave the city. His denouncement of Catiline in the senate has also been a popular motif. Cesare Maccari’s Cicero Denounces Catiline from 1889 shows the latter conspicuously sat alone at the right as Cicero lambasts him from the floor. John Leech (1817–1864), Cicero Denouncing Catiline (c 1850), coloured print in ‘The Comic History of Rome’ by Gilbert Abbott à Beckett, London, further details not known. Wikimedia Commons. 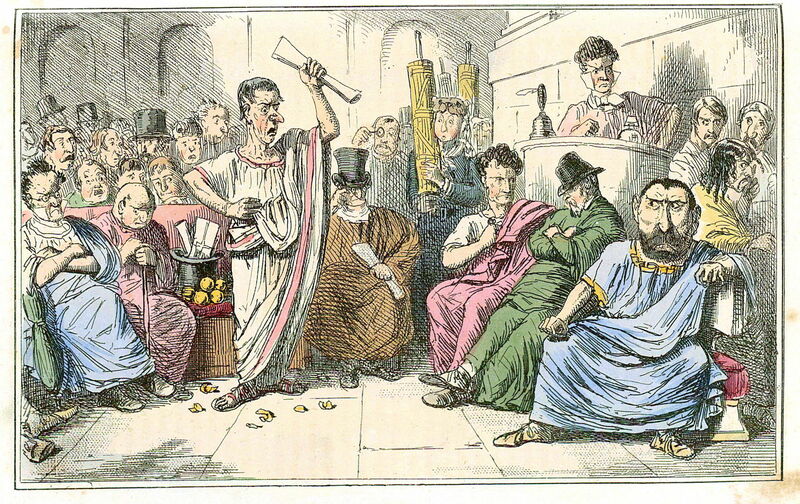 In John Leech’s satirical version of Cicero Denouncing Catiline from about 1850, Cicero is intended to be a caricature of Disraeli, and Catiline is Disraeli’s longstanding opponent in the British House of Commons, W E Gladstone, who is sat at the far right. Taking three hundred armed followers with him, Catiline left to join his forces which had been raised by Manlius, now amounting to some twenty thousand. Together, they toured other cities trying to persuade them to revolt against Rome. Catiline’s cause in Rome was left with his supporter, Cornelius Lentulus Sura, who had been expelled from the senate but was now working his way back as a praetor. He intended to kill all the senators, burn the city down, and only spare Pompey’s children, who would be held as hostages until their father’s return. Cicero had Lentulus’ men ambushed, and obtained from them secret letters concerning an alliance with the Allobroges. Cicero read those letters aloud and examined the men in front of the senate the following day. This destroyed the conspiracy, and Lentulus resigned from office. That evening, Cicero addressed the people and told them what had happened. Later, when he was on his own, he tried to decide what should be done with the conspirators. The following day, the senate considered the problem, and all spoke in favour of the conspirators being subjected to the “most extreme punishment”, which others assumed meant death, until it came to Caius Caesar’s turn to speak: he proposed that their property should be confiscated, and they should be imprisoned outside Rome until Catiline was defeated. Cicero spoke supporting Caesar’s proposal, but eventually the senate agreed that the conspirators should be put to death. By this time, Cicero was falling from favour with the people, and his many books seemed to be full of self-praise. As such a skilled orator, his speeches often included biting jests against his opponents, and these encouraged people to hate him. Cicero became embroiled in the scandal of Clodius, who was found in one of the maid’s quarters in Pompeia’s section of Caesar’s house, causing Caesar to divorce Pompeia on grounds of the suspicion to which it gave rise. Cicero was then attacked by Clodius, forcing Cicero to ally himself with Caesar, who came out in support of Clodius instead. Cicero was then denounced, and in fear of prosecution; he supplicated himself before the people, dressing down and leaving his hair uncut. Cicero was forced to seek aid from Pompey, who was keeping well out of things in his country house in the Alban hills. Pompey evaded him, and Cicero fled for refuge to the consuls, and to take counsel from his friends. Cicero chose to go into exile, and headed by night for Sicily. He was then banished from Rome, and Clodius issued an edict to prevent anyone from giving him aid. With former friends declining to shelter or help him, and his personal properties being burned down and sold, Cicero was on his own. Over the following year, increasing disorder in Rome turned the tide in his favour, and Cicero was welcomed back after less than sixteen months. When Clodius was absent from Rome, Cicero went up to the capitol and destroyed the records of Clodius’ administration. Cato spoke against Cicero, and Clodius was then killed by Milo. Cicero was made an augur among the priests, and was given command of an army of nearly fifteen thousand to control the province of Cilicia. He was successful there, and returned to find Rome falling into civil war. The senate, though, awarded him a triumph. Franciabigio (1482–1525) and Alessandro Allori (1535–1607), The Triumph of Cicero (c 1520), fresco, 580 x 530 cm, Villa medicea di Poggio a Caiano, Poggio a Caiano, Italy. Wikimedia Commons. 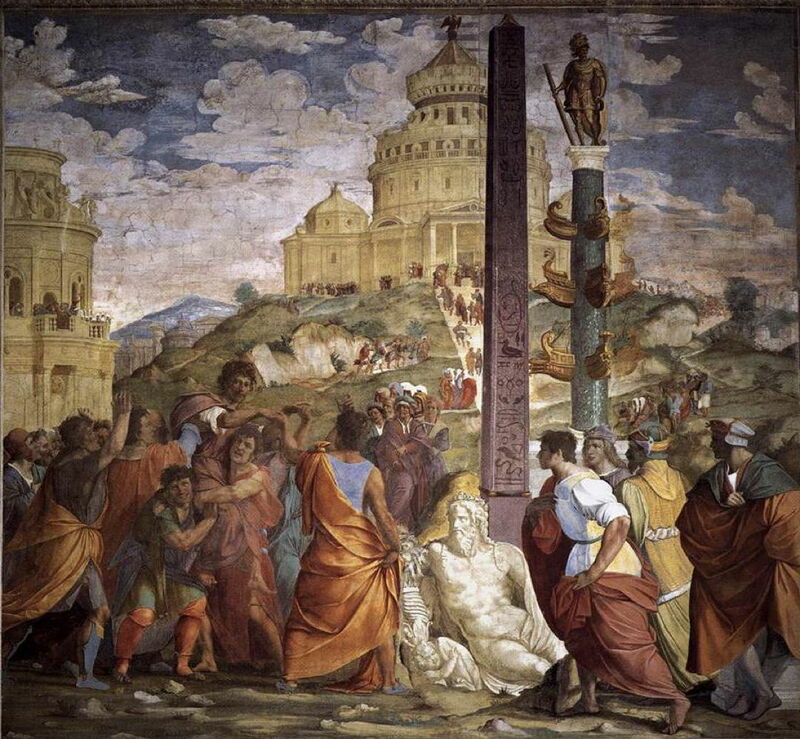 One of the more modest if not humble triumphs of Rome, it is shown in this fresco originally by Franciabigio, with additional work by Alessandro Allori largely in the right side of The Triumph of Cicero (c 1520). When Caesar went to Spain, Cicero sailed to join Pompey, which didn’t work out well. Cicero missed the battle of Pharsalus as he was unwell, and refused Cato’s request for him to take command of the large army and fleet at Dyrrhachium. Pompey would have put him to death for that, had Cato not intervened. Cicero then joined Caesar. When Caesar assumed power, Cicero withdrew from public life, living mainly in the country, where he taught philosophy. He divorced his wife Terentia, and despite his age married a wealthy young woman. He kept out of the plot to assassinate Caesar, only speaking in the senate afterwards to propose an amnesty for those involved. Cicero and Antony were sworn enemies, and the two had several close calls after Caesar’s murder. As Cicero’s power rose again in Rome, he raised a faction against Antony and had him driven from the city. Cicero was then led on and cheated by the young Caesar, for the latter to become consul. Once the young Caesar was successful, he allied himself with Antony, and Cicero’s name was put on a list of two hundred to be put to death. When Cicero learned of this, he was staying in the country, and fled. He got to Astura, where he couldn’t decide whether to go any further, or to return to Caesar in Rome. He went on to Caieta, where he had a summer retreat. He was being carried in a litter through the woods towards the sea when his assassins caught up with him. Cicero ordered the litter to be put down, stretched out his neck, and he was beheaded. Cicero’s head and hands were taken back to Rome, where Antony, who was conducting an election there, ordered them to be put on public display. But the Romans didn’t see there the face of Cicero – rather they saw into the dark soul of Antony. Pavel Svedomsky (1849–1904), Fulvia With the Head of Cicero (date not known), oil on canvas, 67.5 x 138.5 cm, location not known. Wikimedia Commons. Plutarch makes no mention of a popular alternative version of the death of Cicero, which claims that his head was presented on a platter to Fulvia, who would have had every reason to want it, as the widow of Clodius and wife of Antony. 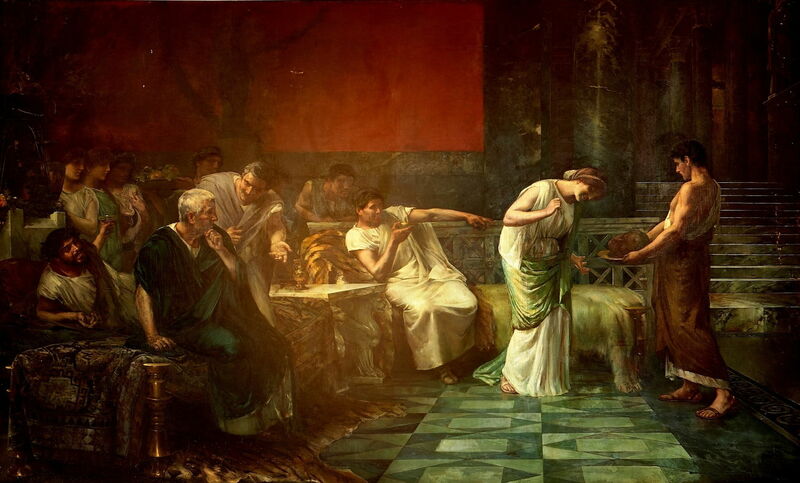 Pavel Svedomsky’s undated Fulvia With the Head of Cicero from the late nineteenth century shows Fulvia sticking hairpins in Cicero’s tongue in return for the orator’s many critical speeches about Antony. Francisco Maura y Montaner (1857–1931), Fulvia and Mark Antony, or the Vengeance of Fulvia (1888), oil on canvas, 340 x 550 cm, Museo Nacional del Prado, Madrid, Spain (loan to Museo Municipal de Bellas Artes de Santa Cruz de Tenerife). Wikimedia Commons. 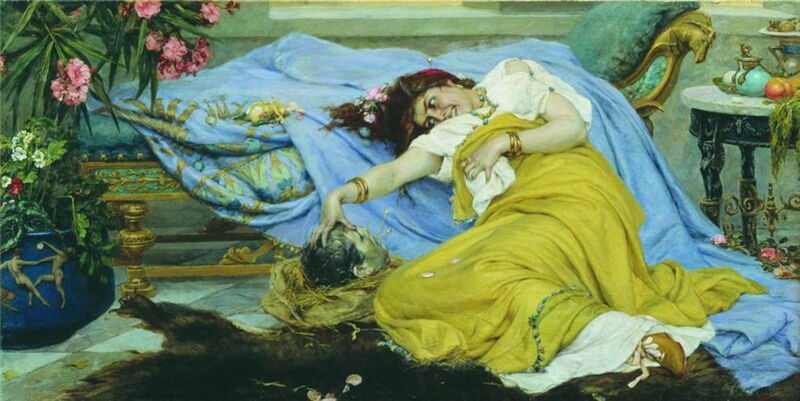 Francisco Maura y Montaner’s Fulvia and Mark Antony, or the Vengeance of Fulvia from 1888 shows Fulvia smiling with glee at Cicero’s head, in a manner reminiscent of another femme fatale of the end of the nineteenth century, Salome, with the head of John the Baptist. Fulvia is here poised with her hairpin, and encouraged by those around her, including Antony. Cicero, whole text in English translation at Penelope. Posted in General, Life, Painting and tagged Allori, Barbotti, biography, Franciabigio, Leech, Maccari, Maura, narrative, painting, Plutarch, Svedomsky, West, Wilson, Zuccarelli. Bookmark the permalink.